Home / Entertainment News, Featured Articles, Gossip and Drama, Videos / A KIKUYU conman dressed like an Akorino Pastor arrested trying to con the Kathiani man who won 33 million Shabiki Jackpot (VIDEO). 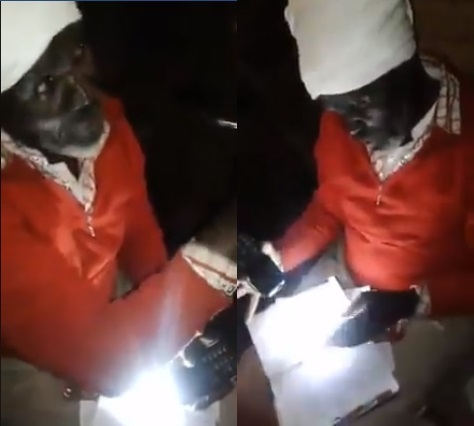 A KIKUYU conman dressed like an Akorino Pastor arrested trying to con the Kathiani man who won 33 million Shabiki Jackpot (VIDEO). Tuesday, August 28, 2018 - A Kikuyu conman who was dressed like an Akorino pastor was arrested in Kathiani where he had gone to con Peter Mumo, the winner of Ksh 33 Million Shabiki jackpot. The conman identified as David Maina Karimi went to Peter Mumo’s home dressed like an Akorino pastor and told him that he had been sent by God to bless his jackpot money. He was demanding for 10% tithe out of the Sh 33 Million from the jackpot winner. Mumo got suspicious about the conman and alerted his neighbours who came baying for his blood. The Kikuyu man was rescued by police who arrived just in time before the mob descended on him. Here’s a video of the conman.